During my time here at Save and Serve, I have felt an increased need to tell people more about what MCC (Mennonite Central Committee) is doing here in the U.S. as well as other countries. MCC is a global, nonprofit organization that strives to share God’s love and compassion for all through relief, development, and peace. As Rocky, our IVEPer this year, said last week, “You are doing good things, but you aren’t telling the people.” With this quote in mind, this blog post is focused on what MCC has been doing, specifically in Bangladesh. MCC focuses on relief, development, and peace, but those terms can be slightly abstract, so let’s take a deeper look at what MCC is physically doing in Bangladesh. MCC is primarily focused on enabling education, connecting people with jobs, and responding to the Rohingya refugee crisis. It should be understood that MCC doesn’t create organizations in other countries, but rather partners with existing organizations that best understand community needs. Canadian Foodgrains Bank provides relief to the Rohingya refugee crisis, making them a great partner for MCC. The Rohingya people are an ethnic and religious minority fleeing violence and persecution from the Myanmar government. There are now more than half a million refugees living in Bangladesh with basic, unmet needs. MCC, along with other partners in the Canadian Foodgrains Bank, are now helping to provide a $1 million response that provides “emergency rations of rice, lentils, oil, sugar, salt, and high energy biscuits for three months” to approximately 26,000 people. While MCC is helping the Rohingya people in Bangladesh, it is also helping people develop their career skills who are Bangladeshi. Luxmi Chambugong is a nursing student in the city of Mymensingh, who is going to college because of funding from MCC. This program is specifically for those students who struggle to pay for schooling. Now with help from MCC, tuition and cost of living are greatly decreased, allowing students to focus on school instead of trying to make school payments. Without help from MCC, her family would have to sell some of their land or animals to be able to afford sending their children to school. She goes to school at the Rumdo Institute of Medical Technology (RIMT). This schooling enables the students to get a good career and increases the possibility of getting a better-paying job. However, a good job is little benefit to someone who lives in an unsafe setting. MCC supports peacemaking in Bangladesh through their partner, the Baromari Catholic Church. On International Peace Day (September 21, 2017), there was a community march in Baromari, so that the message of peace would be on display to the public eye. Both students and adults attended this march. These types of marches are generally accompanied with speeches and dancing or singing. One of the best ways to create peace is to bring people together from different backgrounds and have them join in activities together. These are just some of the stories about all the good that MCC is supporting in Bangladesh. For more stories, visit https://mcc.org/search/site/bangladesh. MCC strives to share God’s love and compassion for all in the name of Christ by responding to basic human needs and working for peace and justice. Bangladesh is just one of 56 countries where MCC is making a difference. In upcoming blog posts, we’ll feature more work from the MCC. Be sure to bookmark the Save and Serve blog page to check back for more posts! I didn’t know exactly what I was getting into when I learned that I got the summer internship position here at Save & Serve, but I knew I was excited to start. I began working at Save & Serve at the beginning of June and will be here until mid-August. After that, I’ll go back for my senior year at Goshen College in Indiana where I’m studying business. I’m not the first to say this and I won’t be the last, but Save & Serve is special. I don’t know of another store that is almost run completely by volunteers, or where there are two or three generations working together in the same department, or where people willingly come in on Thursday evenings to help keep the store open just because they enjoy it. While these aspects of Save & Serve do make it special, what separates Save & Serve from other businesses to me is something fairly basic. Save & Serve is about people. Whether it’s asking how someone is doing, or having a gathering every morning to celebrate the time here of our MCC “IVEPer“. Save & Serve is a place where I see people truly caring for each other. It would be simple to stop there and say that’s enough, but what needs to be said is that this care is shown on a consistent basis. What I see day in and day out is a focused and real desire for imperfect people to feel cared for, regardless of reciprocity. It’s fun to work as a cashier and build relationships with the customers. It’s fun to work in processing and get to talk to Joe or Curtis. It’s fun to share a laugh with Roland about the latest sports news. And it’s easy to enjoy work in a caring environment, which is what I’ve found and come to expect from Save & Serve. A big reason that Save & Serve is oriented toward people is because of the management. There have been numerous times when I have either been told or have seen in action that the managers here at Save & Serve care a great deal for the volunteers. Whether that is helping at the cash register, sharing stories during downtime, or providing morning snacks, it is clear to me that management focuses on building relationships with volunteers — which creates a welcoming work environment both to those volunteers who are new and those who have been here since Save & Serve began. I came to Save & Serve with the expectation that I would learn about business. Every day, I learn something new about the retail portion — how we display books, how a silent auction works, how to process donations. But one of the most important lessons I’ve learned so far is that people are really at the heart of what makes Save & Serve run. It’s not a fancy system or special procedures that make Save & Serve a successful business. It’s relationships and some focused work. After my internship is done, of course I want to remember procedures and my experiences here and apply them to other places. Also, I’ll continue to support MCC and its relief work. But what I want to remember the most is that relationships should be at the center of a business. That is how basic human needs are met in the name of Christ: through relationship. I find it easy to talk about Save & Serve – credit that in part to my length of time here as a manager, going on twelve years. But beyond that, there are so many good things to share that happen at Save & Serve. We often talk about the activities here as a win-win-win for everyone. Our donors benefit by having a place to donate items they no longer need. While freeing up space at home, they can donate with the knowledge that they are helping others. Save & Serve benefits both local folks who may discover a good “find” in our shop, as well as meeting the needs of people around the world through the shop’s proceeds. For volunteers, there are many personal benefits. Maybe I’m making a new friend or deepening an existing friendship. Maybe I get to use a talent that I’ve developed through past experience, or add to my skill set through doing something new. I may also get the satisfaction of knowing that my gift of time is helping someone else, whether that is in Ethiopia or Syria or here in the United States. The benefit for our customers seems pretty straightforward, whether it’s saving money when shopping for clothing or finding a collectible piece. And yet we hear from shoppers that it’s a “win” also in how other needs are met here too. A place to relax after work. Finding pleasure or ideas in the creativity and beauty of our ever-changing displays. I think of the environment and extending the life of material goods. While it may be somewhat of a token act, this is one more way that we can “think green” and care for creation. 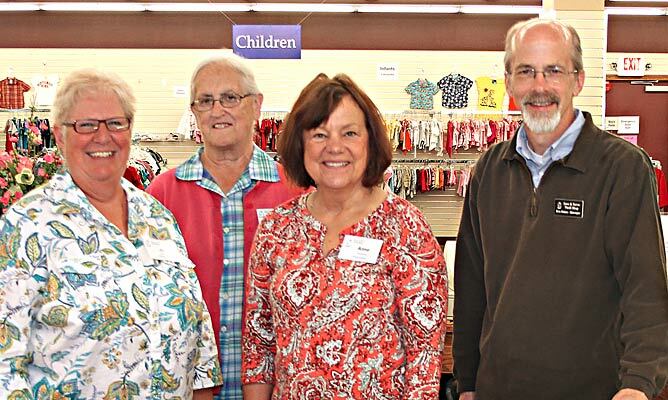 Beyond what we can see and experience here at the store, folks around the world are benefiting by the work of Mennonite Central Committee (MCC). How does this “win” happen? The proceeds from Save & Serve are sent on a monthly basis to meet human needs through the work of MCC. It’s the subject of future blogs, but MCC is involved in over 50 countries, working with partner organizations, to provide relief from suffering, for community development, and for peace initiatives. Save & Serve is a win-win-win for everyone, wouldn’t you agree? So tomorrow, when I provide a tour to a local church group that is coming to learn about our shop, I will find it easy to share what happens here. I can speak about all the different benefits -for donors, volunteers, customers, the environment, and folks around the world. If you haven’t been to Save & Serve, I invite you to come catch a glimpse of this busy little place. Out in the store and behind the scenes, good things are happening. You say that you are already connected to Save & Serve? I’m curious – how would you say that it is a “win” for you?